I have very sensitive skin so it is important that I can not only use a laundry detergent that does not break my budget but that same laundry detergent must also not break out my skin. Natural Elements Purex Ultra Concentrate liquid laundry detergent does both. I really like the ultra concentrate because I can store the smaller bottles easier. I also like the smell that the Natural Elements Purex gives my clothes. I am also very sensitive to smells and do not like anything that smells to flowery or smells to much like perfume. 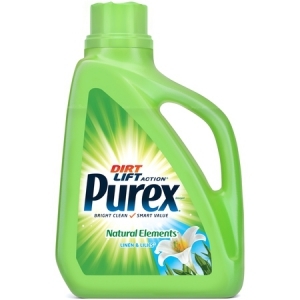 Natural Elements Purex smells like neither, it gives clothes a very subtle “clean” smell. I only have to use a very small amount to clean a large amount of clothes, even my husbands very stinky, very dirty, work clothes. I have not noticed a rash of any sort due to my clothing since I started using this product over a month ago. laundry detergent until I realized the shirt I was wearing had not been worn since summer and had been washed with a different detergent. This made me even more pleased with Natural Elements Purex. I would recommend it if you have skin discomfort from your laundry detergent. I did not allow the liquid detergent and water to mix before I put the item in the machine now I have blue stains on the sweater. Is there any way possible to get them out? Thanks. You might have done some procedural mistake. Or, there might be some residue of previous use stuck in your washing machine which led to blue stain. You can again wash it. Or, use white vinegar to clear the stain.